I'd spent the night camped along Copper City Rd, an excellent dirt road that any vehicle can negotiate. When I awoke in the morning I found Karl parked about 100yds away. Evidently he had arrived before I had the previous night, but I had not seen his car in the dark. Karl had come out to join me for a long weekend around the Barstow area. The first two days were intended to be a tour around BLM lands sandwiched between Barstow to the south and the China Lake/Ft. Irwin military reservations to the north. It turned out we were able to drive close to the base of every summit we visited, on average taking less than an hour for each, including the driving time between them. This allowed us to knock them all out in a single day, and enjoy dinner at the Idle Spurs Steakhouse back in Barstow as reward. An excellent deal. Leaving Karl's Element along Copper City Rd where we'd slept, we carpooled in the jeep for the morning shift, driving about 14mi out to the furthest peaks to the west that we intended to climb. This was the only hike that combined more than one summit, totally two and a quarter miles. Both of these are located northeast of Opal Mountain (climbed previously), which has the same elevation as Peak 3,951ft. We could have made the hike to Peak 3,951ft shorter by driving to the saddle between it and Opal Mtn, but that would have made the loop longer. Instead, we parked on the southeast side of Peak 3,951ft and went directly up the higher peak first, a climb of some 700ft. After taking a few photos we continued on to Peak 3,833ft, 2/3mi to the northeast. The second summit is composed of much darker volcanic rock which forms a strong contrast with the fresh green sprouting up between all the rocks. Knowing that Barbara Lilley had visited in 2006, we were a bit disappointed to find no register from her. We left one of our own, penciling in her ascent before our own, 13yrs later. We were back to the jeep by 9:30a, taking a little over an hour and half for the loop. The next three peaks are closely-spaced in a line running south to north, a few miles west of Copper City Rd. Peak 4,097 is a dark, volcanic mountain whose summit is a large plateau. This made finding any sort of highpoint difficult and ultimately, a bit silly. Plenty of loose rock on this one, and some bits almost approaching class 3. This is the wimpiest of the three, with less than half the prominence of the other two (though still more than 300ft). There were lots of flowers blooming on the south side of the peak as we climbed it. An exceedingly short climb, taking less than 15min to reach the top. 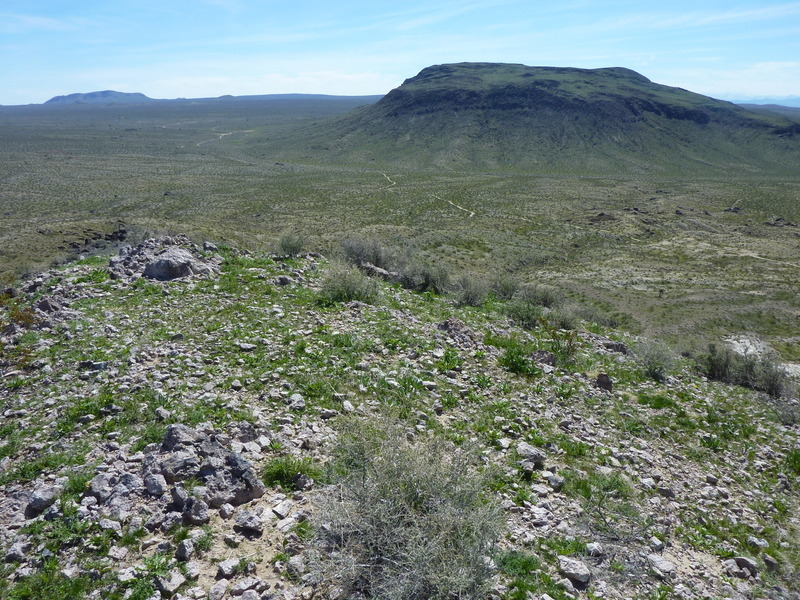 The northernmost of the three and the highest, Mesa BM sports more than 800ft of prominence. We approached it from the east, with old roads allowing us to drive within half a mile of the summit. There was a lot of old camp junk from someone who had regularly used this for camping and shooting before abandoning it with some of his stuff still strewn about. With cliffs on most sides of this flat-topped summit, we used a convenient ridgeline running up the SE side through the cliff band. We found the benchmark and a register left by Barbara & Gordon in 2006. There were a few other entries as well, about one every couple years. These two isolated summits are found on the east side of Copper City Rd, just north of our campsite. We climbed the higher Wells BM from the west, following one of two ridges on the west side (I went down the other ridge, finding them about equal). Like Mesa BM, there was a benchmark and a Lilley/MacLeod register, this one dated a day later in October of that same year. There was also an older single sheet of paper that predated the register booklet, none of the names from the usual suspects. Because the two summits were separated by only a mile and half, Karl chose to hike between the two while I went back to the jeep and drove it around to the south side of Peak 3,831ft. I beat Karl to its summit by about five minutes - he was halfway up the north side when I looked over the top of the summit and spotted him. There are two points of similar height on Peak 3,831ft, both of which I visited, but the western one appears highest. This peak lies about 4mi south of the previous one. We went back and picked up Karl's vehicle before driving south on Copper City Rd. There are scattered homesteads in the area south of the peak and numerous roads through the area suggesting it was planned to be a bigger development at one time. Only a few of the homesteaders remain with others abandoned, burned or both. With very little prominence, the climb up from the southwest took all of 12 minutes. Lane BM is located just west of where Copper City Rd goes over a low, shallow saddle between the Mud Hills and the Calico Hills. Lane BM is the highpoint of the Mud Hills, though it makes for a somewhat unimpressive summit. It is located in an open-access OHV area and is a driveup with a high-clearance vehicle. We found a busy geocache at the summit, the entries dominated by motorized visitors. The benchmark here was placed in 1985 by the Defence Mapping Agency. There is a telecom installation about half a mile to the west, likely maintained by the China Lake or Ft. Irwin folks. The last two summits are isolated little bumps located further south, within sight of paved Irwin Rd. The closer proximity to Barstow means more dumped garbage and badly maintained homesteads. Dirt roads criss-cross throughout the area and are popular with OHV enthusiasts - there were several wagon trains of RVs circled up with motorcycles and ATVs collected in the center. There is a pretty rough 4WD road that we drove up the west side of Peak 3,380ft to within a few hundred feet of the summit, making for a 3min climb.